Recently I received a comment from a reader asking me how to subscribe to receive email updates when I post something new. That wasn’t the first time a reader was frustrated by this. I realize that there’s so much information on any one of my posts or pages that it might be hard to find this information. So I decided to write a quick set of instructions showing you how. All you need to do is click on the Follow button and a little box should appear asking you to enter your email address. After you’re done with that you should see a confirmation message like the one in the screenshot below. vsatips contains 2 types of content. 99% of the things at my site are Posts…which contain my most recent news, tips, user guides or reviews…etc. Pretty much everything I write is done in the Post format. When readers subscribe to receive updates, they receive an email each time I write a new post. 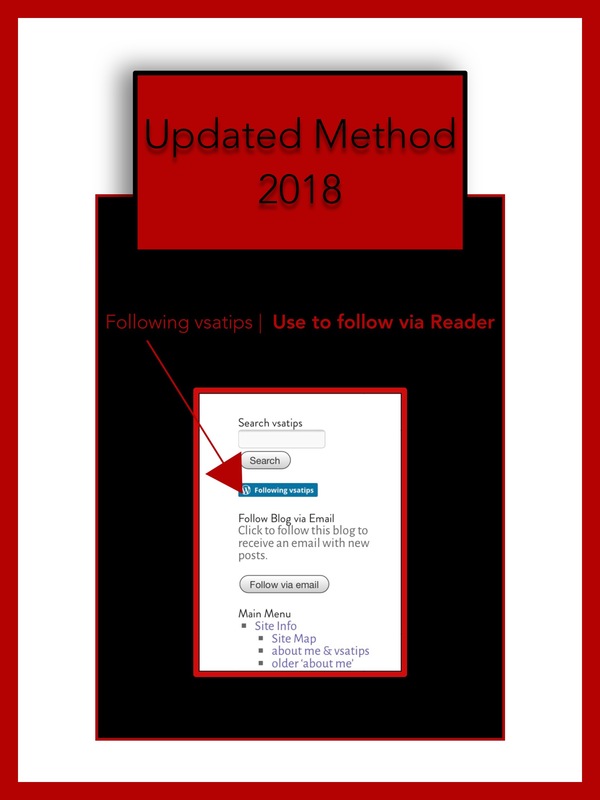 The entire post will be included in the email…saving you the time of having to tap or click on a link and then being taken to my site. This also saves you time from having to check back periodically for new content. But there is one caveat. It’s sort-of a personal quirk of mine. For a very long time after I began this site I never knew how to get the dashboard we use for writing to proofread my work before publishing it. The only way I knew to trigger the proofreading utility was to first publish my work. Then, immediately after it was published the proofreader would be auto-triggered, showing me typos and errors I’d made. While this was frustrating, it was something I just got used to with time. So, immediately after publishing I’d complete my final corrections. Of course, many iterations of using my own proofreading techniques preceded this…but despite all my efforts in that regard there were always several more errors I’d missed. That would be OK if subscribers just received a link to that new post…and that’s what I always believed happened. Then, one day I accidentally subscribed to my own site. I didn’t even know that this was possible. I’d always assumed it wouldn’t let me…but it did. So when I submitted a new publication a few days later I was pretty shocked to see that I received the entire article in an email. Even more shocking was the typo I saw in that post’s Title. For whatever reason…a lot of the typos that seem to remain longer, avoiding detection, are ones that occur right at the beginning. I’m not sure why that is. But maybe it’s because I found out that one of the best ways to proofread something is to hear it read out loud to me. I use Instapaper for this. So, maybe when I start the screen reader I’m a little preoccupied and I don’t really settle into the whole process for a few sentences? That’s the only thing I can think of. But when Subscribers see my new posts and they consistently have errors in the first few sentences or worse, in the title, which the proofreader skips entirely…it can’t help but leave a negative impression. So, rather than think negatively of me…I thought that by my describing why that occurs, that would be preferable. Also, I want everyone to know that if typos and errors are really annoying to you, (because they are to me,) if you just click on the link in the email…then you’ll be taken to the actual post which will be all fixed up…because the fixing step happens immediately after it’s published! Kind of a dumb system right? In addition to Posts, which readers can subscribe to, a second type of content found at vsatips are Pages…which is really short for Webpages. For all practical purposes posts appear to readers to look exactly like pages do. And they really are from all I can tell. But posts are in a format that’s internally different at WordPress. It’s one that allows them to be sent out as email updates to subscribers. Whereas true pages are really intended to be more static, therefore never-changing. I’ve primarily used pages as navigational tools for grouping categories of information together so that they can be included in menus with similar content. But, in some cases pages also have ended up becoming post-like…or appearing to be more like articles that impart helpful information. What usually happened in those instances is that a page began as a navigational tool but I added some information to it too. Overtime I may have added more information until it grew long enough to be considered a post as well. But Subscribers will never receive an update about new information that appears in pages…or in posts either for that matter. So if I update something Readers have no way of knowing that. This realization really just came to me as I’m writing this. And it presents a whole different problem that I need to address too. Why newly published pages cannot be sent out to Subscribers, I’m not really sure of. But that’s just the way WordPress works. So, in the rare case that a page ends up becoming a resource of some kind I occasionally may write a post about it just to alert readers that this new information exists. Because posts are the only tool I have to notify readers of new content. So, that’s exactly why I’ve included the following section on the newly updated Tablets page. That’s exactly what occurred recently with my Tablets page. I began adding various categories of resource links and periodically updated those. While in the process of doing that this year…I completely upgraded my Tablet page with almost all new information yesterday. So if you, or anyone you know is in the market to buy a new Tablet this fall or as a Christmas present…the articles I’ve linked to on my new Tablets Page might prove to be really useful. Here’s a link to that Page and a screenshot of it below. This entry was posted in About me, Email subscribers, Tablets and tagged Email subscriptions, Following WordPress blogs, Subscribe to WordPress blog, Tablet Buying Tips, Tablet Reviews, Tablets. Bookmark the permalink. How do I get permission to use your information? I am the Chairperson of a CIG program for a genealogical Society and I would like to pass on some of the information in your posts. Thanks so much for your visit and inquiry. I’ll email you with information.